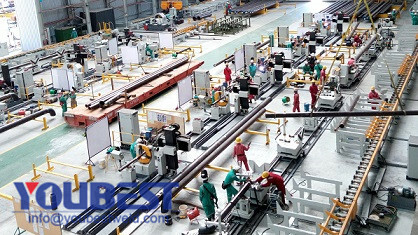 Pipe Spool Fabrication | Pipe Prefabrication - YouBest Machinery Co., Ltd. Pipe Spool Fabrication: in a fixed area manage the design, fabrication, pipe cutting, pipe groove processing, welding, logistics and anti-corrosive paint, pipeline inspection, etc. Piping prefabrication advantages: convenient in the area of fixed quality, progress, management, coordination and control, reduce the workload site prefabrication and installation, for the whole project installation, quality, progress has greatly improved. Pipe spool prefabrication modernization: the piping prefabrication production line and software, equipment, can use advanced piping prefabrication automation equipment, improve the efficiency and quality of piping prefabrication, maximize exert the superiority of the piping prefabrication.